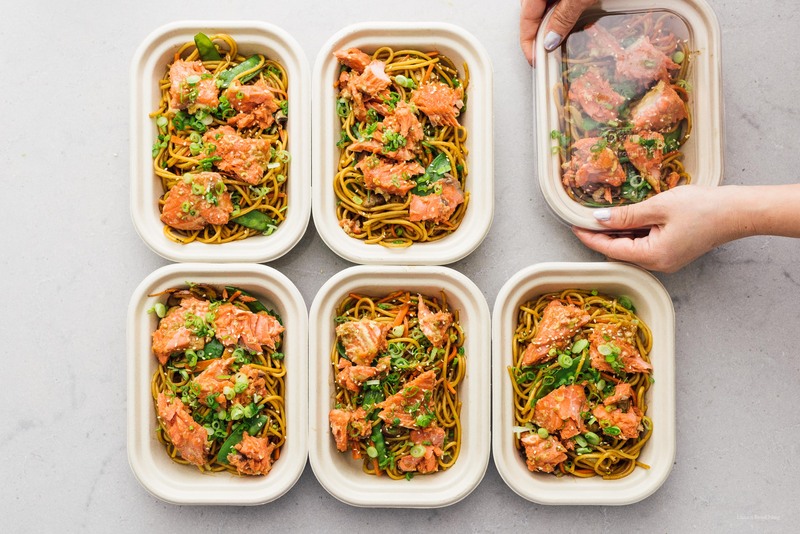 Save time, money and calories when you prep for the entire week: honey garlic salmon and veggie spaghetti lo mein meal prep! Hello meal prep! It’s taken me a while to jump on board the meal prep train but now that I’m here I don’t think I’m going to be getting off any time soon. I don’t really know why it took me so long to get here, but I think it’s because I was kind of intimidated by the idea of meal prep. I just couldn’t really get my head around it. I was like, huh? 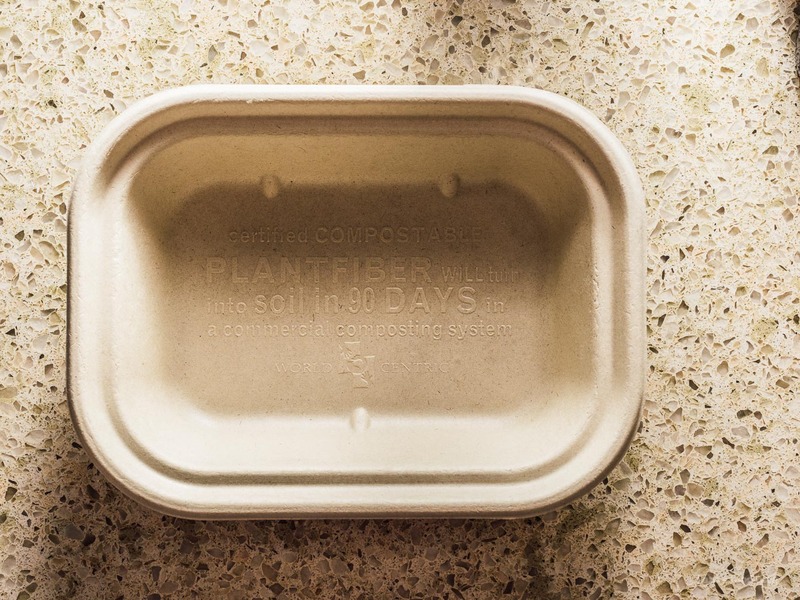 It seemed like you needed special containers (you don’t, but it helps make things pretty and neat, we love these compostable ones) and some sort of super organizational skills, but you don’t! The funny thing is, even though we have a food blog, the truth is I’m really really bad at planning meals. Sometimes I get carried away with what I’m doing and forget to eat. Or sometimes I get overwhelmed and have choice paralysis. It’s weird, I know. Anyway, when we were moving, we were on the go constantly and food didn’t seem as much of a priority as fitting all of our things into boxes. I pretty much forgot about eating. Except I didn’t really – I just got hangry. Extremely hangry. It wasn’t pretty. 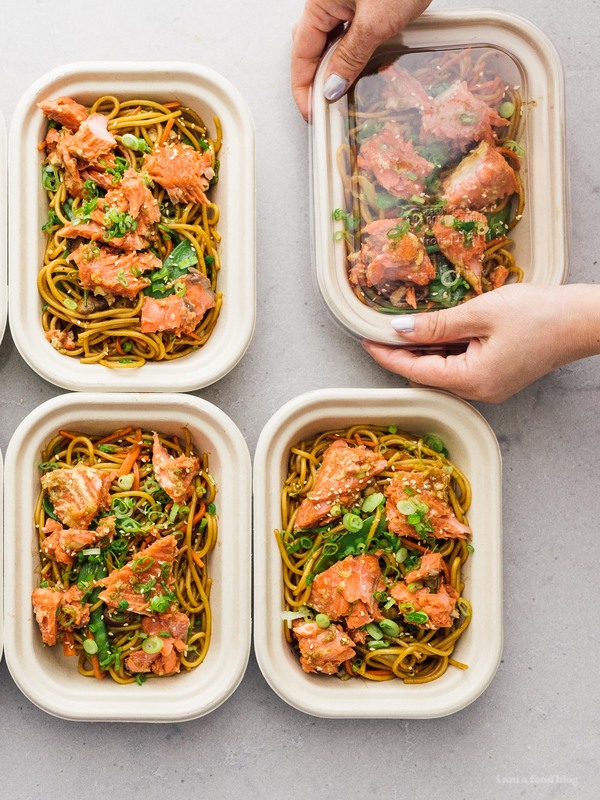 So, in efforts to not be hangry anymore, meal prep came into our lives. Meal prep, if like me, you don’t get, is essentially cooking a huge amount of food and portioning it out so that you have meals in the fridge, ready-to-eat. It’s kind of like you’re your own little Whole Foods with all those yummy pre-portioned lunches in the takeaway section. Except it’s even better because it’s your fridge. I’m a mega convert, especially ever since Mike said that meal prep is kind of like bento making, except for regular food, not cute food. Don’t get me wrong, I’m still into cute food. Maybe I should do some cute meal prep plans!? Anyway, we got some cool compostable containers and went to town with the ideas. There are a bunch of containers out there and the truth is you don’t really need to use specific ones but we chose these ones from McDonald Paper because I want to do a lot of picnicking/hiking this summer and I don’t want us (Mike, let’s just be honest) to be lugging plastic/glass containers in our packs. These guys have the bonus of being super light and made of super renewable biodegradable wheat straw fiber. 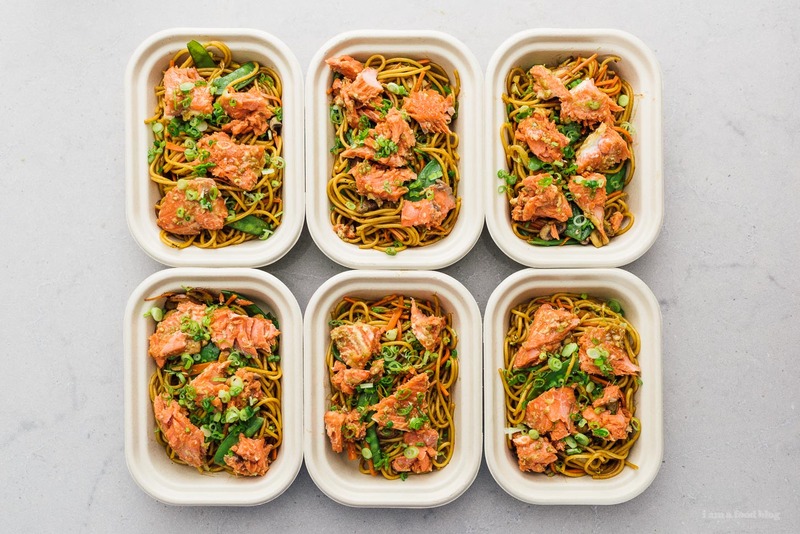 I’ve made a couple of meal prep things now but this honey garlic salmon lo mein meal prep was the first we made and it was Mike’s favorite. He loved the salmon the most but I loved the noodles, because noodles. Everything came together quickly, in a hour, even with taking photos and the end result was well worth it. I think the key to meal prep is, well, prepping. The majority of cooking is all about preparing ingredients. Actually cooking goes pretty quickly, in my opinion. To start off, you need to prep your vegetables, including peeling and mincing garlic. 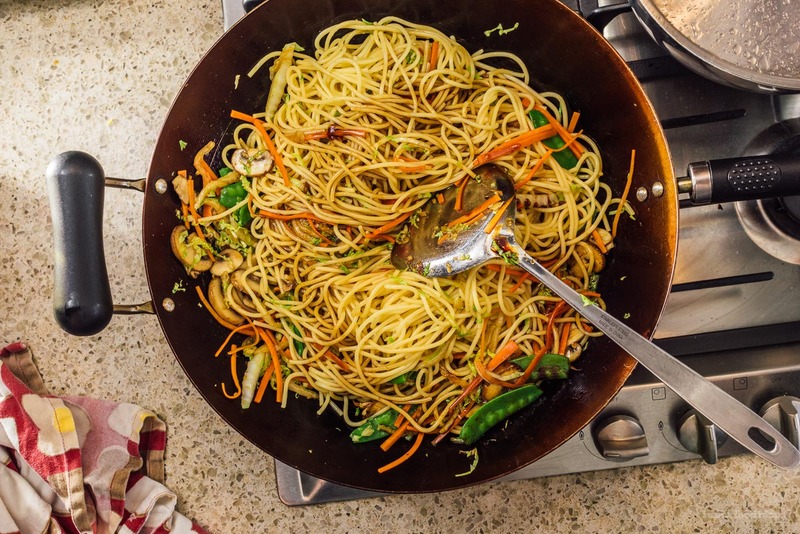 Sauces are mixed, then you pop your salmon in the oven, cook the spaghetti, toss the lo mein, and then portion everything out. Boom! You’ve got 6 meals, ready to eat, plus a little bit for a chef’s snack because I couldn’t resist. 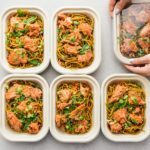 PS – This is a sponsored post but I am in LOVE with meal prep and these containers :) Let me know all your meal prep ideas because I want to meal prep all the things! PPS – They didn’t ask me to say this but it’s true, restaurant supply stores are the best and cheapest way to stock a home kitchen with really cool stuff. Check out McDonald Paper’s website, it’s full of cool and really fun stuff like $5 knives and my dream cotton candy machine! Mince all of the garlic and prep all of the vegetables so that you’re ready to cook. Bring a large pot of salted water to boil over high heat. 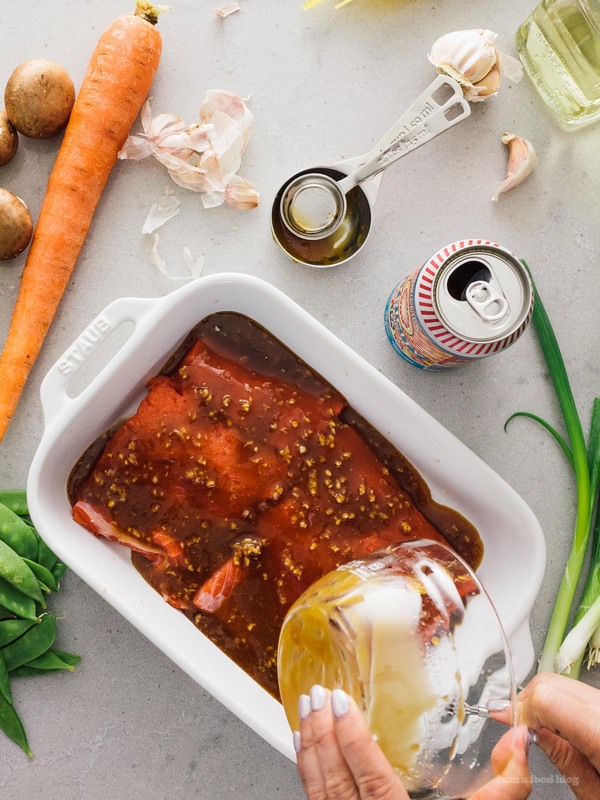 In a small bowl, whisk together the honey garlic sauce for the salmon: honey, light soy sauce, neutral oil, toasted sesame oil, and garlic. Spread out half of the honey garlic mix in a roasting pan or dish. Lightly season the salmon with salt on both sides, then place on top of the sauce. Evenly spread the remaining sauce on top. Bake for 30 minutes. While the salmon is baking, cook the spaghetti according to the package. 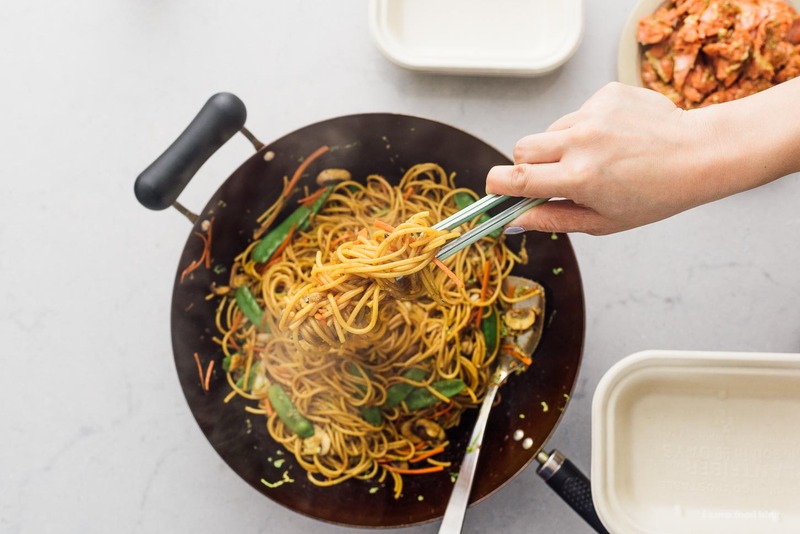 As it’s cooking, whisk together the lo mein sauce ingredients: chicken stock, soy sauces, toasted sesame oil, sugar, and a generous amount of pepper. When the spaghetti is done, drain well. Heat up 1 tablespoon of oil in a very large skillet or wok over medium heat. Add the garlic and stir, for about 30 seconds. Add the mushrooms and cook, without stirring until slightly caramelized, about 2-3 minutes. Toss and continue to cook. Add the carrots, snow peas and napa cabbage. Cook until brightly colored and tender, about 2 minutes, stirring occasionally. Add the spaghetti to the pan and toss. Stir in the sauce and mix until combined. By this time, the 30 minutes for the salmon should be up. At the 30 minute mark, try to flake the salmon with a spoon – it should flake easily and if it does, it’s done. if you can’t easily do so, leave it in for another 5 minutes. 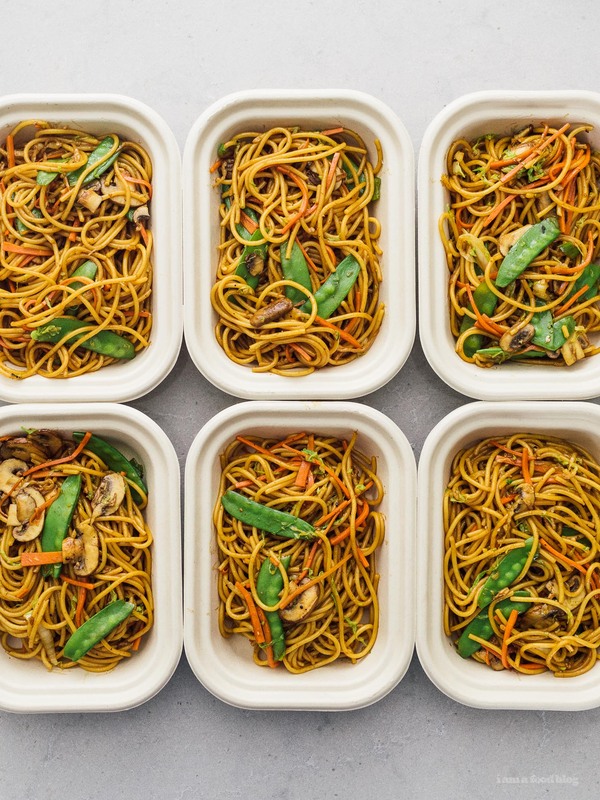 Divide the lo mein evenly amongst meal prep containers. 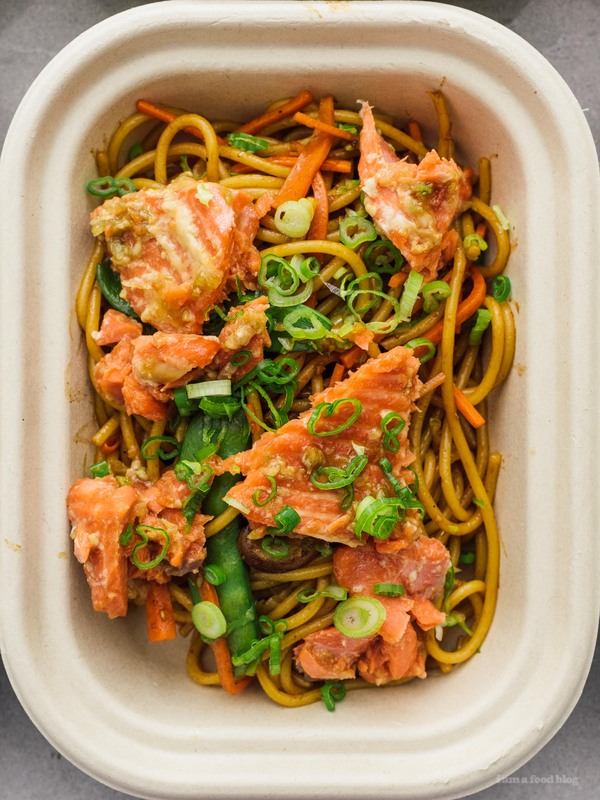 Flake the salmon into 2″ chunks with a spoon and divide evenly on top of the lo mein. Sprinkle on green onions and toasted sesame seeds. You have meals for a week! We partnered with McDonald Paper to bring you this post, but all opinions are our own. McDonald Paper & Restaurant Supplies provides commercial kitchens, restaurants and home chefs with all the necessary equipment and supplies for over 25 years. Thanks for supporting iamafoodblog! 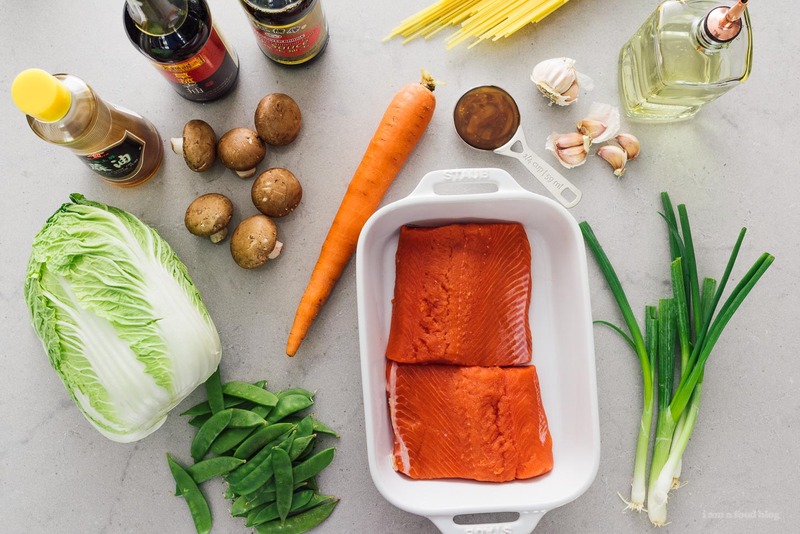 I always want to make fish to meal prep, but how long does it really last? Like 2 days? Or do you eat it all week without any issues? hi kate, we ate it for 4 days – it made 8 servings and we had 1 each everyday for 4 days with no issues. hope that helps! just entered it in myfitnesspal and it came up as 675 cals :) hope that helps! 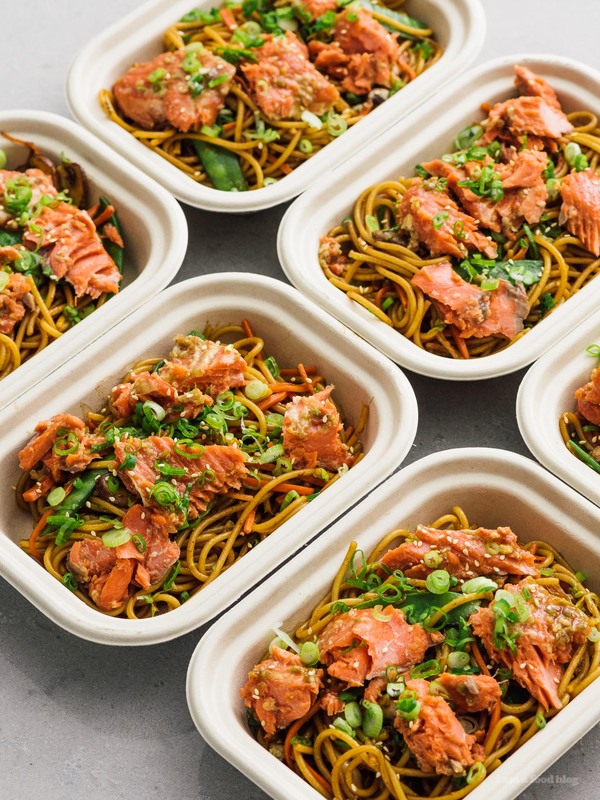 omg i want someone to meal prep me unagi don for a year!!! they’re supposed to go in when the other vegetables do. i’ll update the recipe. thanks for the heads up!